What’s All the Fuss About Bitcoin Anyway? It’s hard not to have heard of Bitcoin at this point. The cryptocurrency is up 650% over the past year, hitting new all-time highs last week at $4,300.00, from $0.05 in July 2010. And we’re not messing up our decimal places here; that’s 4 thousand three hundred dollars per Bitcoin today, up from five cents per Bitcoin a few years ago. It’s no wonder names like Fidelity and Goldman Sachs now accept Bitcoin as a viable currency. Put that all together and Wall Street has changed their tune when it comes to gains like this. But what is Bitcoin? In simplest terms, Bitcoin is a new form of money. Or, as the financial folks like to call it – a new type of currency. And what is money/currency, after all, besides just something that is accepted as a form of payment? Some people call Bitcoin “digital money” but money is already digital. You aren’t squeezing quarters through the phone line when paying with that credit card, right? The part that makes Bitcoin different than just “digital money,” is that it doesn’t need a bank or a government to work. Instead, it uses math and the ability to store all of its transactions on itself (like a huge dollar bill with every payment it was ever used for written down on the bill). From that standpoint, it’s more like digital gold. Bitcoin is digital money that doesn’t need a bank. Bitcoin is digital money that uses cryptology to ensure trust & fungibility in a theoretically tamper-proof decentralized ledger called a blockchain. If there’s no bank or government issuing this digital money where does it come from? This is the part where most people’s eyes gloss over. It’s digitally “mined.” We like to think of it like this: When you mine gold, you get a bunch of machines and dig in the ground until you find the gold. With Bitcoin, there is no ground… there is an equation instead. So instead of Gold hidden under tons and tons of dirt and rock, Bitcoin is hidden under tons and tons of math. To mine it, you set your machines (computing power) to “dig” through that equation until it hits the “bottom” and finds the Bitcoin. But there’s not an unlimited supply of Bitcoin out there. In fact, Bitcoin’s volume is determined by an equation – with the limit of the most Bitcoin that can be mined equal to 21 million. The best explanation we found was on Quora – breaking down when and how new Bitcoin are released. A block ( think of it as transaction data organized in a digital ledger) introduces 50 new coins into the bitcoin ecosystem. This quantity mined halves every 210,000 blocks. For instance, the reward for mining a block was most recently cut in half on July 9th, 2016 from 25 bitcoins to 12.5 bitcoins as reward for solving the Byzantine general’s problem. 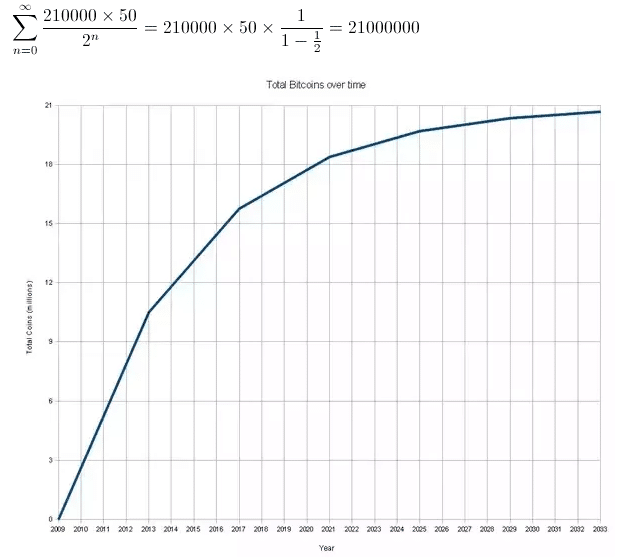 The next halving event occurs every four years with the next one slated for 2020 with a block reward amount of 6.25 bitcoins. According to this website – 16.52 million Bitcoin exist in the world right now, with a total market value of $74 Billion. 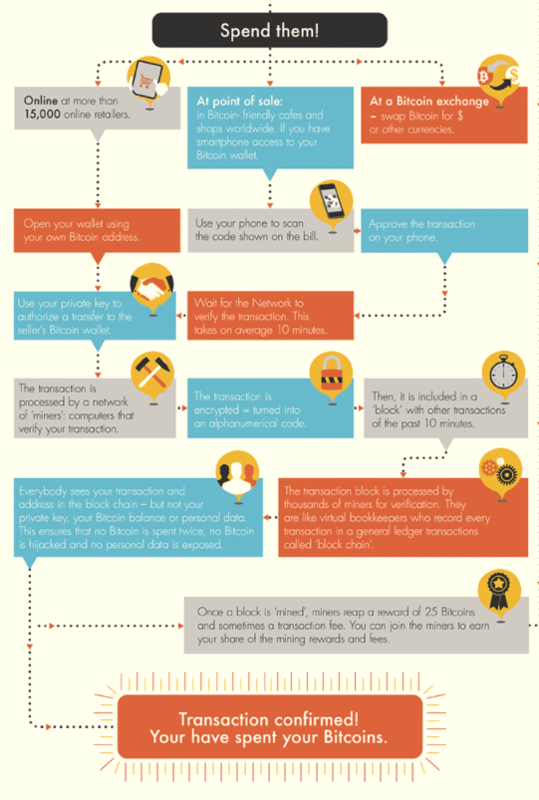 Each time a new transaction takes place, a Bitcoin is mined, or any piece of information is recorded – it’s referred to as a block that gets added onto the blockchain. So the blockchain is theoretically endless. But don’t get the idea that this is something unique to Bitcoin. 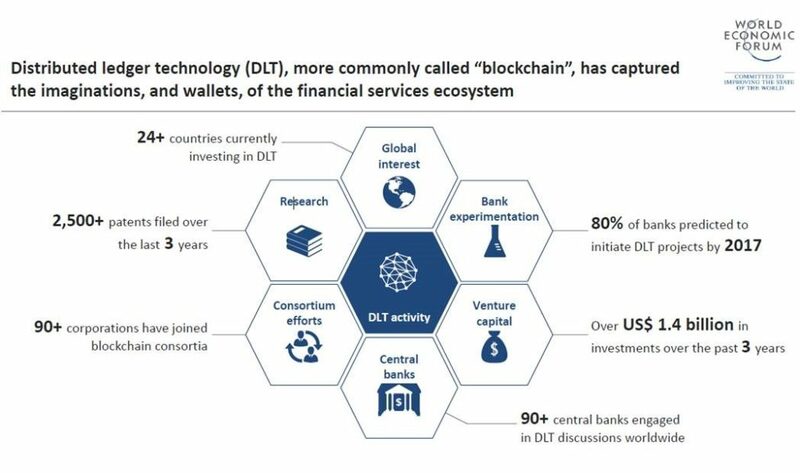 And It’s not just one of two companies utilizing this technology, the entire financial services ecosystem has bought into the idea – via the World Economic Forum. Time will only tell how fast this technology gets accepted as mainstram until it becomes integral to everyday life. What if you don’t own a server farm that can mine Bitcoin all day? Then what? Well, there’s seemingly an infinite amount of crypto exchanges out there setup to facilitate the exchange of one currency or another for different cryptocurrencies like Bitcoin. Do a Google search for “Bitcoin exchange” if you dare and spend a few days of your life reviewing them all at your own peril. Think of it like those little booths at the airport, only all online. These have not been without their share of drama and intrigue, with thefts and bankruptcies and fraud all happening at one point or another:. And there’s even Bitcoin ATMs, if you want to physically interact with a machine in order to get your virtual asset, or weirder yet, exchange some of your Bitcoin for dollars to spend somewhere, which sort of goes against the whole purpose of the Bitcoin in the first place. If one Bitcoin is worth roughly $4,300 dollars, one would think it would make transactions for smaller items difficult, right? Not necessarily. 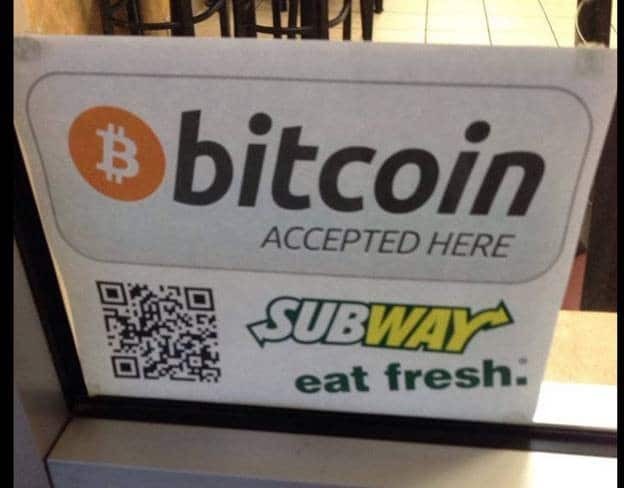 Bitcoin is accepted and used in more places than you might think. For instance, Subway! They’ve been doing it since at least 2013! Once our subs were made the employee took out an iPad and opened Coinbase. She punched our total in the register and then in the iPad, which immediately generated a custom QR code linked to the store’s Coinbase account which was preloaded with our exact total calculated. I took out my iPhone, opened my Coinbase app, and scanned the QR code. Instantly the total popped up on my screen and gave me the option to leave a note about my purchase.”Subway” seemed appropriate. If there’s no bank, and it’s digital – where do I keep my Bitcoin? Imagine Bitcoin is your school lunch. You need a locker to put it into to keep it safe. There are unbreakable see through containers on display for you to store them at school. You can access as many locker’s as you want to store your lunch, as there is an endless supply of locks – and each unused locker you can use with its own locker combo. Everyone can see what kind of lunch is in there, but they don’t know it’s yours, and they can’t access it without your combination. This is what people describe as your online wallet. But, Just like any wallet – a virtual one can be stolen as well. Just last year, “an early Bitcoiner” had millions stolen in Bitcoin using only phone numbers. He had kept it offline for most of the past several years, but had connected that device in recent weeks to move them somewhere more secure and sell some. Though he had locked it with a 30-character password, the hackers moved the coins off. And unlike a credit card transaction, a transfer of a cryptocurrency is irreversible. There’s no issue when it comes to using Bitcoin, but the currencies movement is keeping it from becoming more legitimate. Currencies that we’ve come to know move in price all the time, just not as fast or rapidly as Bitcoin. For instance, Bitcoin is worth $3,200 more than it was that at the beginning of 2017. 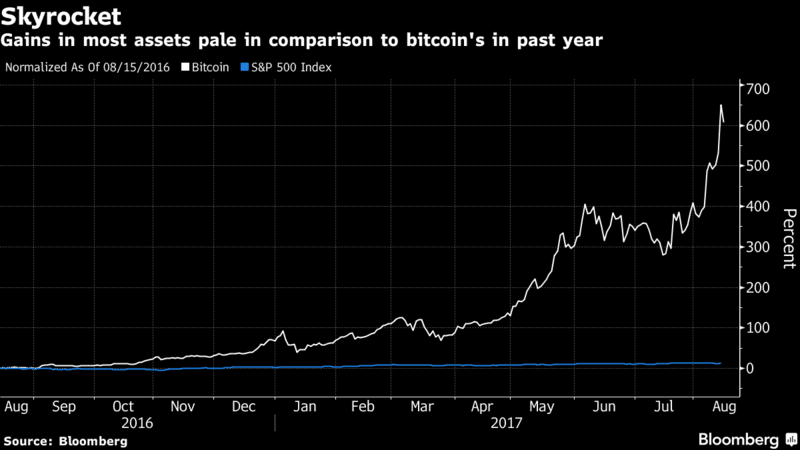 Investors who have Bitcoin might be scared to use it in fear of the cryptocurrency continuing to grow in value (i.e. why spend the Bitcoin you have on groceries if it’s going to double in a couple months?). Early adopters to Bitcoin might be playing the waiting game to sell most of it. So, it’s almost turned into an investment rather than a currency. Does Bitcoin need to be both for its further acceptance in everyday culture? Does the Bitcoin market need to become more stable in order for more and more people to start using it? Or do we let the market fly free and wait to see how much the market gains before we reach the limit on the amount of Bitcoin in the market? The man who bought Subway using Bitcoin seems to think the answer is Bitcoiners using it for purchases. Transactions will be the backbone of bitcoin’s future. If you really want to support bitcoin’s longterm success, you need to support bitcoin-accepting businesses by making purchases. Unfortunately, due to the volatility of bitcoin over the past year, many people are choosing to sit on their investment and watch it rise and fall in value. So, maybe you don’t want to actually use Bitcoin, but you’re interested in some of those charts showing it going up and to the right sharply. What to do? Well, there was a much-publicized effort by the Winklevoss twins (yes, those made famous by the Social Network movie) to get SEC approval for a Bitcoin ETF – but it was denied (temporarily sending Bitcoin prices crashing, by the way). Others have looked to $GBTC, the Bitcoin Investment Trust which trades over the counter and is not yet listed on an exchange. There’s just one issue there, the trust is being bid up well above the value of its Bitcoin holdings. Then there are some penny stocks which provide crypto currency services, but proceed with much caution there. Of course, not everyone believes this is an investable asset. There’s famed hedge fund manager Howard Marks, who called the internet bubble, saying Bitcoin is a pyramid scheme. As for us in the alternative space, the CBOE recently announced its plan to launch Bitcoin futures to allow those looking to profit another avenue that paying the premium above. It’s like some smart people in the space recommended this years ago…. CBOE and Gemini expect the deal to pave the way for the exchange to launch Bitcoin futures contracts by the end of the year, pending regulatory approval. The Bitcoin futures will be cleared via the Options Clearing Corporation, the exchange said. Gemini, which is regulated by the New York State Department of Financial Services, acts as a gateway for users who want to trade bitcoins but also have it linked with a normal bank account. CBOE will retain exclusive rights to use Gemini market data for the creation of new indices, as well as rights to distribute Gemini market data over the options exchange market’s data feeds. Bitcoin, and all of the other cryptocurrencies which have followed are exciting because they are at the intersection of finance, technology, equality, anonymity, and independence. It has the potential to dramatically change the way transactions take place, to depower banks in favor of individuals, to drastically lower fees and layers of access to people’s own worth. If nothing else, it will have ushered in the age of Blockchain technology which has applications outside of the digital currency. Time will only tell whether Bitcoin will be a winner take all winner like Google or Amazon, or whether all of the cryptocurrencies can co-exist in some manner. Not to mention what will happen when we’ve reached the upper bounds of limit on the amount of Bitcoin in the world (perhaps that will stabilize the market and make it a real currency). Are we going to 25,000 on Bitcoin, or zero as it’s exposed as a scam? Both sides are passionate about it. But we’ll greedily grab a seat and watch the show, given the launch of futures on Bitcoin, which would benefit from the volatility and pushes one way or the other. 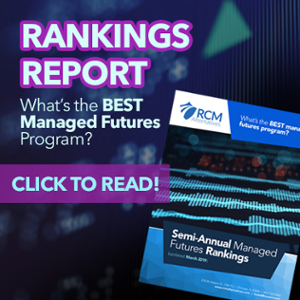 New to futures markets? Need help understanding how margin works, this crazy $5 tick size, 5 bitcoin contract size, etc? We’re here to help. Call us at 855-726-0060 to talk to one of our professionals about setting up an account. And/or check our this idea we have for gaining exposure to some of Bitcoin’s upside, while trying to eliminate most of its downside. If you’re looking for a deeper dive into the Bitcoin world, we suggest checking out the Bitcoin Wiki page as well as their FAQ. 08/21/17 – Monday’s Interest-ing Reads | Compound Interest-ing!